Til tilhængere af rundremiser se link til fransk hjemmeside, hvor der også er bloklink. Godt ser det ud, rundremiser er bare ikke så gode til værksted, da pladsen omkring lok ofte er for lille, men fint til klargøring. Det er en 600 mm museumsbane der har valgt og bygge en rundremise som skulle lige en nu nedrevet original rundremise idéen til sidebygningen kommer også herfra. Spændende projekt! Jeg kunne godt tænke mig sådan en bygning på HVB. Den skaber stemning! Og utroligt så meget man kan finde i Frankrig, som er relativt ukendt. 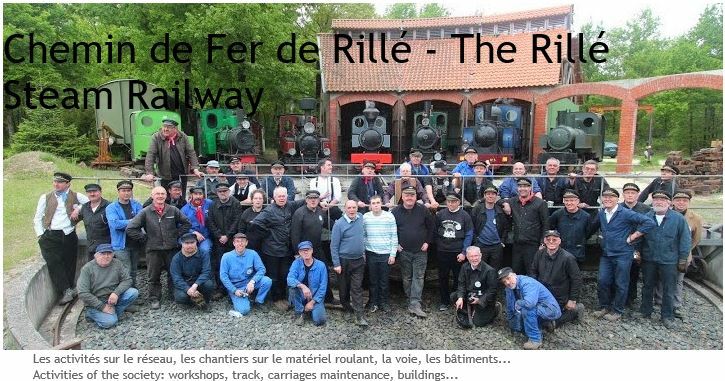 Thanks for sharing our blog with your members, greetings from french society AECFM operating the Rillé railway and building the roundhouse. I used google translate to read your post and I understand you have concerns about the space available around the locos. In fact, if there is little space between the doors, there is plenty towards the outer ring which allow to work easily. If you follow the "roundhouse" keyword shortcut of our blog, you could see other articles with pictures. If you need some details, feel free to ask. Ours is not finished, some unique features are yet to come ! By the way, congrats for your intense activity, I wish we could show also this level of commitment, our "young" blog is there to help us to show what we do. I will forward your blog url to our internal forum. Best regards from fellow enthusiasts. Hi Nicolas. We are very impressed of your building but also all those steam locos. We have talked about the possibility to take a trip one day and visit your place. Your blog seems to have its success among some of our members. It helps us to identify our forces and weakness compared to what is done somewhere else. So, congrats for what you do, it is very impressive. If you guys plan to come around, I have been told that our 40th anniversary would be celebrated on 2017 spring, probably with a local event and invited machines running simultaneous trains. If you plan to visit us, let me know (auroreborealeATclub-internet.fr)and I will arrange to welcome your team as deserved. In spite we are a 600mm gauge railway, we do also have a modified 760mm gauge steam loco matching what your are used to see. I will also try to celebrate the 100th anniversary of my own Brigadelok live on its original boiler!